Gouache on paper, A4 (8.27 x 11.69in). For sale – $50. When I was a girl, I lived near the Great Barrier Reef and my parents would take us snorkeling. This was back when the reef was still bright and beautiful, rich with coral and tropical fish that I could see just by peeking under the water. 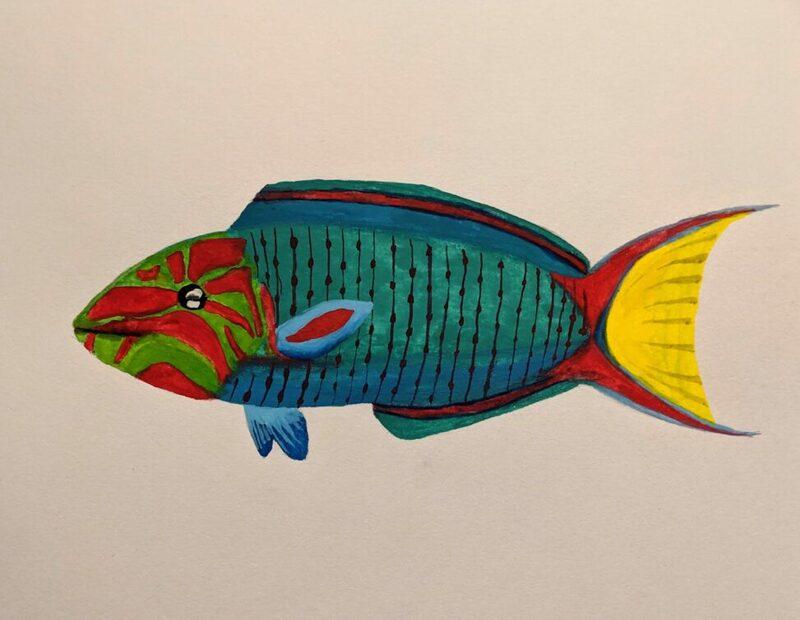 The Moon-faced Wrasse is one of the fish that I admired the most. As it moves, it flaps its fins in a peculiar up-and-down motion so that it looks like it’s flying through the water. One time, my parents decided to keep tropical fish in our house in a 6ft long fish tank. My Dad didn’t want to waste money on the pet store – he knew where to find tropical fish. So he went out to sea and caught some Moon-faced wrasse, some wire-netting cod, and several other terrified fish and plopped them into the fish tank. They were huge, and the wire-netting cod preferred to bury themselves in the sand at the bottom of the tank which made the water all cloudy. So it wasn’t an entirely successful exercise but the Moon-faced wrasse were still very pretty. I even kept a few of them in some fish tanks as part of a senior Biology experiment to measure the efficacy of undergravel versus trickle-down filtration systems (the fish were all fine, but I can confirm that trickle-down is way better for oxygenation). When I last visited the same area of the reef again a few years ago, it was all dead. The coral was brown and decayed, there were barely any fish. It was an underwater wasteland. It made me so sad. Recent statistics show that most of the reef is like this now, largely due to the impact of climate change. It’s so sad that this is going to be a tale we tell to the next generation – “I remember when I used to go snorkeling in the reef and it was so beautiful”. It’s not too late – some parts of the reef are recovering as some species of coral are proving more resilient than most and we may be able to cultivate these. The best thing we can do right now is to put pressure on our governments to take action against climate change.